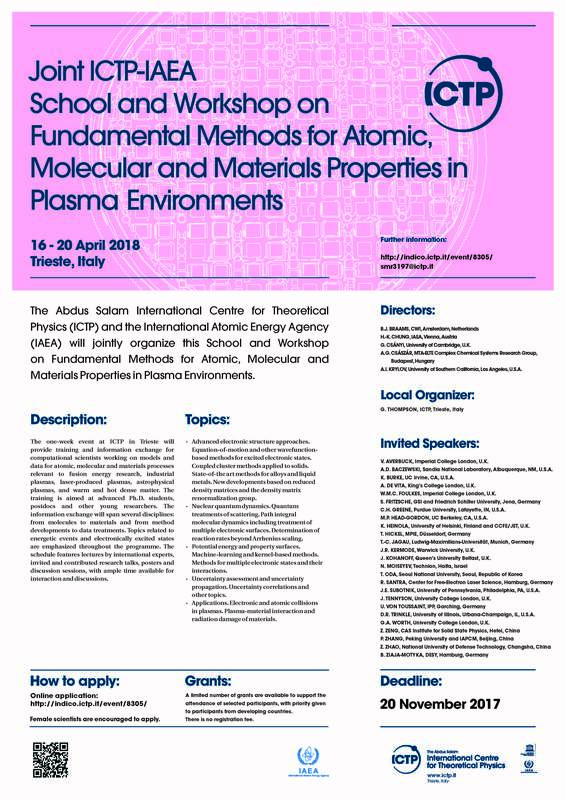 The Abdus Salam International Centre for Theoretical Physics (ICTP) and the International Atomic Energy Agency (IAEA) will jointly organize this School and Workshop to be held at ICTP in Trieste, Italy, from 16 to 20 April 2018. The event will provide training and information exchange for computational scientists working on models and data for atomic, molecular and materials processes relevant to fusion energy research, industrial plasmas, laser-produced plasmas, astrophysical plasmas, and warm and hot dense matter. The training is aimed at advanced Ph.D. students, postdocs and other young researchers. The information exchange will span several disciplines: from molecules to materials and from method developments to data treatments. Topics related to energetic events and excited electronic states are emphasized throughout the programme. The schedule features lectures by international experts, invited and contributed research talks, posters and discussion sessions, with ample time available for interaction and discussions. Deadline: 24 November 2017. Late applications not requesting financial support can be considered while space permits. ICTP Activity Website (event smr3197). ICTP Activity Announcement (A3 Poster). Applications for participation are due by Friday 24 November 2017. After 24 November the organizers will commit the budget and the housing allocation. Late applications by highly qualified persons can be considered as long as space permits, but the organizers will not be able to provide financial support for late applicants. Interested persons may contact the Directors through b.j.braams@cwi.nl for instructions about a late application. There is no registration fee for attending the event and accommodation at ICTP or in the vicinity is available at low cost. We encourage applications from around the world. In order to apply please access the online application form at the ICTP activity website. A scientific contribution (normally a poster, but some may be selected for a talk) is expected from each participant. Applicants are requested to attach a one-page abstract of their contribution in the Research Abstract sub-section under Professional Data when completing the online application form. A number of poster prizes will be awarded, courtesy of the journal Physical Chemistry Chemical Physics (PCCP). The poster boards have dimension 1.25m (height) by 1.22m (width), so they can accommodate an A0 poster in either portrait or landscape mode. Directors: Bastiaan J. Braams (CWI, Amsterdam, Netherlands), Hyun-Kyung Chung (Gwangju Institute of Science and Technology, Korea), Gábor Csányi (University of Cambridge, UK), Attila G. Császár (MTA-ELTE Complex Chemical Systems Research Group, Budapest, Hungary) and Anna I. Krylov (University of Southern California, Los Angeles, USA). Local organizer: George Thompson (ICTP). IAEA officer: Christian Hill (Nuclear Data Section, IAEA). Administrative support: Ms Doreen Sauleek, Ms Margherita Di Giovannantonio (ICTP). For advice about visiting ICTP and travel to Trieste please first see the Visit ICTP web page and note in particular the information there about visas, transportation, accommodation and services at the Centre. Also note the campus map under At ICTP and start at this Google Map for the broader view. For housing issues participants should primarily communicate with housing@ictp.it. For other issues please communicate with the conference secretary or with one of the directors as appropriate. Most air itineraries to ICTP go through Rome or Munich to Trieste Friuli Venezia Giulia Airport (TRS). Some participants may find it attractive to fly to Venice instead, even spend a day there, and then use train service or a rental car to get to ICTP. Participants should note the excellent bus connection from TRS airport to ICTP (line 51, get off at Grignano) and from Trieste train station to ICTP (line 6). Coming from the airport on line 51 to its Grignano stop one walks down the hill to the Adriatico Guesthouse or one walks along the Strada Costiera towards the ICTP main complex and the Galileo Guesthouse. Coming from Trieste on line 6 one gets off at its final stop (Grignano Beach) for Adriatico or one is very alert and manages to get off at the earlier stop at the ICTP main complex for Galileo. See the links to Airport Transit, Train Service and Trieste Local Buses on the ICTP Transportation page for more information. Atomic and molecular processes, plasma-material interaction and material properties are extremely important in plasma applications including fusion energy research, astrophysical science, laser- produced plasmas and other plasma environments and their investigation requires sophisticated methods for electronic structure computations and nuclear dynamics. Electronic structure theory is at the core of all investigations and one common thread throughout the applications for plasma environments is the need to consider excited electronic states. Essentially every atomic or molecular collision process that is of interest has the possibility of charge transfer, and it means that at least two electronic states are relevant, while for the case of electron-atom and electron-molecule collisions there is no a priori bound to the number of relevant electronic states. For high energy particle-material interactions, including radiation damage processes, the treatment of electronic excitation is a particular challenge that is the subject of active fundamental work. A second common thread that will be emphasized in this school and workshop is the need to provide uncertainty estimates for computed data. In many cases development of the basic tools for uncertainty assessment for computed data is a topic of active research. A broad community is involved in the development of atomic, molecular and materials data for plasma applications, ranging from those that do fundamental methods development to those that perform the best possible applied computations. Both on the side of methods development and on the side of applications there is significant overlap between the molecular and the materials side, especially as fundamental electronic structure methods for atoms and molecules are increasingly being applied for materials as well. The school and workshop will assemble a cross section of this broad community. The programme will feature lectures on fundamental methods, a few survey talks on applications, and contributed talks and posters ranging from methods development to significant applications. Advanced electronic structure methods: Equation-of-motion and other wavefunction-based methods for excited electronic states. Coupled cluster methods applied to solids. State-of-the art methods for alloys and liquid metals. New developments based on reduced density matrices and the density matrix renormalization group. Nuclear dynamics: Quantum treatments of scattering. Path integral molecular dynamics including treatment of multiple electronic surfaces. Determination of reaction rates beyond Arrhenius scaling. Potential energy and property surfaces: Machine-learning and kernel-based methods. Methods for multiple electronic states and their interactions. Uncertainty assessment and uncertainty propagation: Uncertainty correlations and other topics. Applications: Electronic and atomic collisions in plasmas. Plasma-material interaction and radiation damage of materials. The desired participants by application are researchers working in the field of modelling and simulation of atomic, molecular and plasma-material interaction processes and related materials properties in connection with fusion energy research, astrophysical science, laser- produced plasmas and other plasma environments. Some participants will come from a plasma applications background, but then they need to be acquainted already with computational methods in atomic, molecular or materials science, so familiar with relevant electronic structure theory, quantum dynamics or molecular dynamics approaches. Other participants will come from theoretical atomic, molecular or materials science and for those participants we expect that their work is concerned with or at least is relevant to applications in a plasma context. The event is not for beginning PhD students, but it could be valuable for established researchers that want to broaden their outlook. Applications for participation are accepted through the ICTP webpage for this event. A scientific contribution (normally a poster, but some may be selected for a talk) is expected from each participant. Applicants are requested to attach a one-page abstract of their contribution in the Research Abstract subsection under Professional Data. Invited speaker Professor Robin Santra of Center for Free-Electron Laser Science - DESY and Department of Physics, University of Hamburg, Germany, will also present an ICTP Institute Colloqium on Tuesday 17 April on the topic Atoms in Intense Light Fields. Invited speaker Professor Nimrod Moiseyev of Technion in Israel will organize a mini-course on Resonances in Nature based on his book Non-Hermitean Quantum Mechanics (CUP, 2011). The event will take place on Wednesday and Thursday afternoons after the main programme of talks. The mini-course is concerned with resonance phenomena as appear in different fields of atomic, molecular and optical sciences. In exercises participants will run interactive codes that explain the resonance tunneling phenomenon. In order to take full advantage of this event participants should have MATLAB (from MathWorks, Inc.) installed on their laptop. The zip folder NHQM-Tutorial contains tutorial tasks in the file ‘tutorial.pdf’ and MATLAB files (with file extension ‘.m’). For doing the tutorial tasks these MATLAB files must be copied to a directory on the user's laptop and then MATLAB must be run from this directory. Please see the NHQM Tutorial Instructions for more information and a screenshot. Vitali Averbukh / Marco Ruberti, Imperial College, London, UK: Ab initio many-electron theory of attosecond spectroscopy. Andrew D. Baczewski, Sandia National Laboratory, Albuquerque, NM, USA: Warm dense matter: what theory is telling experiment, what theory could tell experiment, and why method developers should care. Bastiaan J. Braams, Centrum Wiskunde en Informatica, Amsterdam, Netherlands: Constructing effective hamiltonians for multiple electronic states and their intersections. Hyun-Kyung Chung, Gwangju Institute of Science and Technology, Korea: Spectroscopic analysis of electronic structures in dense plasmas. Gábor Csányi, University of Cambridge, UK: Machine learning approaches provide interatomic potentials with DFT accuracy: tungsten and iron as examples. Alessandro De Vita, King’s College London, UK: Accurate and fast dynamical simulations using machine learning force fields. Matthew (W. M. C.) Foulkes, Imperial College, London, UK: Electronic properties of warm dense matter studied using the density matrix quantum Monte Carlo method. Stephan Fritzsche, Helmholtz Institute GSI and Friedrich Schiller University, Jena, Germany: A fresh computational approach to atomic structures and processes for astro, plasma and material physics. Martin P. Head-Gordon, University of California, Berkeley, CA, USA: Density functionals from rung 3 to rung 5: Recent progress and prospects. Tilmann Hickel, Max Planck Institute for Iron Research (MPIE), Düsseldorf, Germany: Ab initio thermodynamics of point defects in metals: Hydrogen, vacancies and their interaction. Christian Hill, Division of Physical and Chemical Sciences (NAPC), IAEA, Vienna, Austria: Managing large atomic and molecular data sets: HITRAN, ExoMol and CascadesDB. Thomas-Christian Jagau, Ludwig-Maximilians-Universität, Munich, Germany: Complex variable coupled-cluster methods for autoionizing and Stark resonances. James R. Kermode, Warwick University, UK: Multiscale QM/MM simulation of chemo-mechanical processes in materials: from crack propagation in silicon to dislocation motion in tungsten. Jorge Kohanoff, Queen’s University Belfast, UK: Electron-nuclear dynamics in irradiated systems: Ehrenfest and beyond. Anna I. Krylov, University of Southern California, Los Angeles, CA, USA: CAP EOM-CC approach for multiple bound and continuum-embedded states: theory and examples. Nimrod Moiseyev, Technion, Haifa, Israel: Resonance phenomena in nature and how to calculate them. Takuji Oda, Seoul National University, Seoul, Republic of Korea: A systematic method to construct potential models: for tungsten materials in fusion reactors. Robin Santra, DESY and Universität Hamburg, Hamburg, Germany: Molecular imaging and plasma formation. Joseph E. Subotnik, University of Pennsylvania, Philadelphia, PA, USA: Methods for solving nonadiabatic problems and charge flow at molecule-metal interfaces. Jonathan Tennyson, University College London, UK: Electron-molecule collision for plasma physics applications. Udo von Toussaint, Max Planck Institute for Plasma Physics (IPP), Garching, Germany: Estimation of atomistic properties using computer simulations and UQ methods. Dallas R. Trinkle, University of Illinois, Urbana-Champaign, IL, USA: Exact theory of mass transport in crystalline solids and its application to solute transport in zirconium. Graham Worth, University College London, UK: Quantum dynamics methods for molecular excited states: MCTDH and beyond. Zhi Zeng, CAS Institute for Solid State Physics, Hefei, China: The understanding of H/He irradiated in W by a multi-scale approach. Ping Zhang, Peking University and IAPCM, Beijing, China: Warm dense matter from first-principles molecular dynamics simulations. Zengxiu Zhao, National University of Defense Technology, Changsha, China: Dynamic calculation of atomic processes under intense light. Beata Ziaja, DESY, Hamburg, Germany: Solids underway to warm dense matter state. All participants have the opportunity to present a poster and some contributors also have a speaker slot (O). Posters will remain up throughout the week. Pedro Amaro, Universidade Nova de Lisboa, Portugal: Dielectronic recombination of MNN in highly charged Tungsten with open f-shells. (O) Zsuzsanna Benda, University of Munich (LMU), Germany: Structure optimization of temporary anions with CAP-EOM-CC methods using analytic gradients. Soumaya Bezzaouia, University of Tunis El Manar, Tunisia: Theoretical study of Rydberg states of HeH+ ion using the Halfium model. Moazzam Bilal, Helmholtz-Institut and Friedrich-Schiller-Universität, Jena, Germany: Accurate theoretical lifetimes data in the prospects of high precision future experiments. Islem Bouhali, University of Tunis El Manar, Tunisia: Theoretical study of Rydberg states of HeH+ ion using the Halfium model. Kalyan Kumar Chakrabarti, Scottish Church College, Kolkata, India: Electron induced processes in molecules and molecular ions relevant in industrial, fusion and astrophysical plasmas. (O) Jiayu Dai, National University of Defense Technology, Changsha, China: Structures and transport properties of warm dense hydrogen. Daniel Darby-Lewis, University College London, UK: Synthetic spectra of BeH, BeD and BeT using vibronically resolved R-Martrix data for modelling of emission from the JET plasma. (O) Madhusmita Das, Bhabha Atomic Research Centre, Mumba, India: Radiative properties of atoms in plasma. Jérôme Deprince, Université de Mons, Belgium: Plasma environment effects on K-lines of astrophysical interest. Szabolcs Góger, University of Pannonia, Hungary: Theoretical studies on the dynamics of the HO + HBr → H2O + Br reaction. (O) Yong Hou, National University of Defense Technology, Changsha, China: Multi-charge-state molecular dynamics and self-diffusion coefficient in the warm dense matter regime. Felix Iosif Iacob, West University of Timișoara, Romania: An analytical fit of adiabatic potential energy surface. Foram M. Joshi, G H Patel College of Engineering and Technology, Vallabh Vidyanagar, India: Theoretical electron scattering studies with atomic molybdenum and MoS2. Sunil Kumar, Banaras Hindu University, Varanasi, India: An experimental set-up to study non-radiative collisional processes relevant to fusion edge plasmas using low energy ion and electron impact. (O) Henrik Larsson, Christian-Albrechts-Universität, Kiel, Germany: Efficient approaches to multidimensional quantum dynamics: Dynamical pruning in phase, position and configuration space. (O) Xiaochun Li, Institute of Plasma Physics, Chinese Academy of Sciences, Hefei, China: Molecular dynamics simulations of H/He interaction with W.
Yonggang Li, Institute of Solid State Physics, Chinese Academy of Sciences, Hefei, China: Monte Carlo simulation of ion implantation, sputtering and primary damage in complex nuclear materials. Chetan Limbachiya, The M.S. University of Baroda, Vadodara, India: Electron driven processes for plasma feed gases. Thomas Melzer, University College London, UK: . Marta Mendez, CONICET–UBA, Buenos Aires, Argentina: Inelastic collision calculations of heavy targets. (O) Edmund Meyer, Los Alamos National Laboratory, NM, USA: Velocity auto-correlation functions in the dense regime. (O) Janos Zsolt Mezei, Institute of Nuclear Research, Hungarian Academy of Sciences, Debrecen, Hungary: Resonant electron-molecular cation collisions in the edge plasmas of fusion devices: new state-to-state cross sections and rate coefficients. Milan Milovanović, University of Belgrade, Serbia: Spin–orbit coupling and intersystem crossing (between 4∆ and 6∆ states) in iron monocyanide (FeCN). Marko Mitić, University of Belgrade, Serbia: Theoretical spectroscopy of the diacetylene cation in the ground X 2Πg and low-lying excited electronic states. (O) Tanmoy Mondal, Birla Institute of Technology & Science - Pilani, Goa, India: Quadratic to higher-order Jahn-Teller coupling effects and subfemtosecond proton dynamics in tetrahedral systems. Sifiso Nkambule, University of Swaziland, Kwaluseni, Swaziland: Dissociative recombination of H2O+. Matic Pečovnik, Jozef Stefan Institute, Ljubljana, Slovenia: The effect of grain size on the transport of deuterium in tungsten. Nicolina Pop, West University of Timișoara, Romania: Reactive collisions of electrons wiith molecular cations: Effects and appliation to H2+, BeD+. Kushal Ramakrishna, HZDR and Technische Universität, Dresden, Germany: Dielectric response function for warm dense matter states. Francisco Ramírez, Universidad de Buenos Aires, Argentina: Real time electron dynamics using TDDFT. Prashant Sharma, Inter-University Accelerator Centre, New Delhi, India: Investigation of ion-atom collision dynamics using x-ray spectroscopy technique and its implications in physical processes. Suvam Singh, Indian Institute of Technology (Indian School of Mines), Dhanbad, India: Electron and positron induced scattering from propene. Nidhi Sinha, Indian Institute of Technology (Indian School of Mines), Dhanbad, India: Positron impact cross section of atoms relevant to pair plasma study. (O) Wojciech Skomorowski, University of Southern California, Los Angeles, CA, USA: Theoretical predictions of bound and continuum states in cyanopolyyne anions. (O) Minaxi Vinodkumar, V P & R P T P Science College, Vallabh Vidyanagar, India: Dissociative electron attachment studies of di & tri atomic molecules. Chuanguo Zhang, Institute of Solid State Physics, Chinese Academy of Sciences, Hefei, China: Long-term evolution of cascades in bcc tungsten: effects of size distribution of interstitial clusters. (O) Jing Zhao, National University of Defense Technology, Changsha, China: Strong-field ionization inducing multi-electron-hole coherence probed by attosecond pulses. The active link for each speaker name goes to a pdf file of the presentation. All events take place in the Leonardo da Vinci Building (the ICTP main building). The talks are in the Budinich Lecture Hall. Invited talks (I) are allocated 30 minutes and contributed talks (O) are allocated 15 minutes. 16:00 – 17:30 Side event on Resonances in Nature by N. Moiseyev. Posters still up. 15:45 – 17:30 Side event on Resonances in Nature by N. Moiseyev. Posters still up. 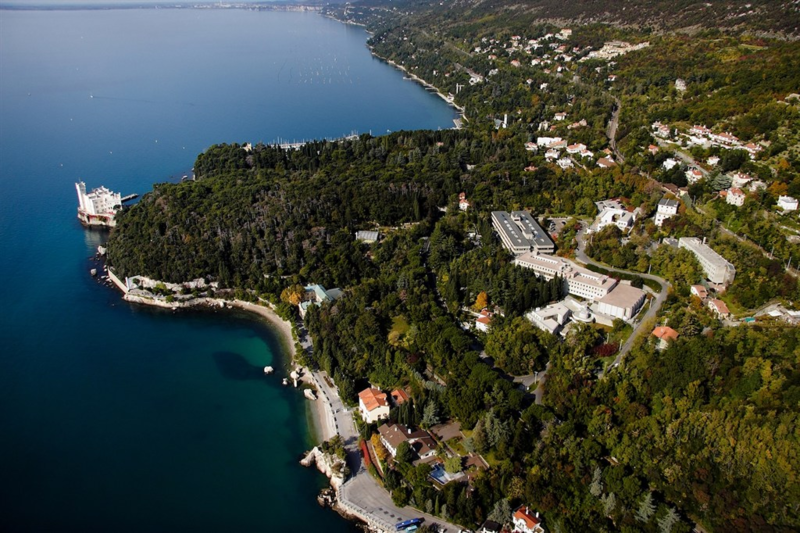 The event is held on the ICTP campus, which is located next to Miramare Park and Castle, about 7 km from the centre of Trieste. Image courtesy, credit and/or copyright (c) ICTP. Source: ICTP Media Centre (> Picture Galleries > ICTP Campus). 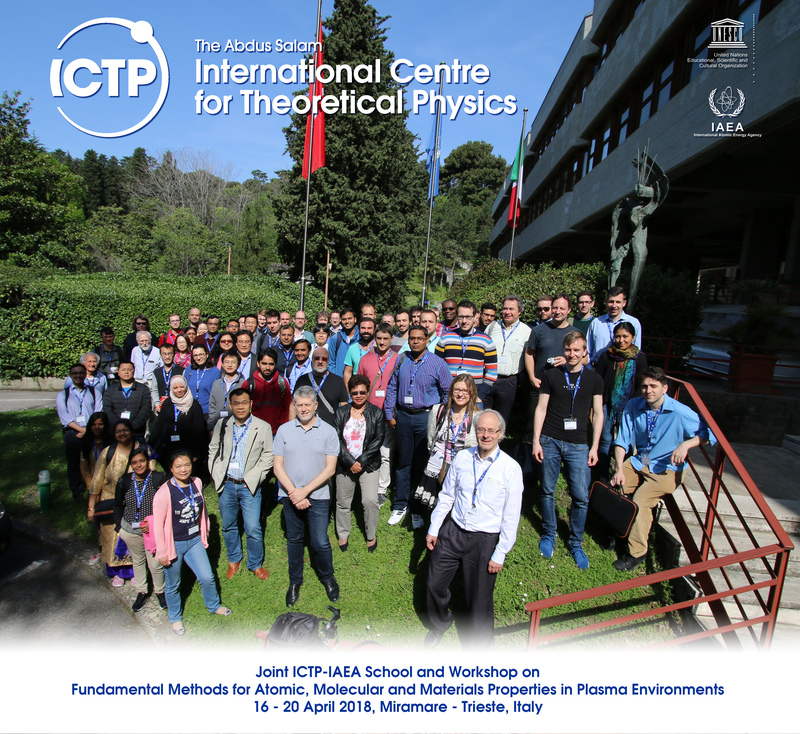 See the A+M Data Unit Workshops web page for information about earlier joint ICTP-IAEA events in the area of atomic, molecular and materials data for plasma and fusion applications. See the ICTP Scientific Calendar for more information about conferences, workshops and other activities organized by ICTP in Trieste and elsewhere. The present event has been advertised on several meetings lists (thank you!) and these lists may be a good source of information about many other events of related interest. Calendar of meetings maintained by IAEA A+M Data Unit. IEEE Nuclear and Plasma Sciences Society (NPSS) Directory of Plasma Conferences. Americal Physical Society meetings calendar. Molecular Dynamics News list at jiscmail.ac.uk. AAS Laboratory Astrophysics Division (LAD) newslist. Email list of the European Task Force Laboratory Astrophysics. COMS Conferences and Meetings on Plasma and Gas Discharge Physics. COMS Conferences and Meetings on Condensed Matter Physics. COMS Conferences and Meetings on Atomic and Molecular Physics. Royal Society of Chemistry events list. Royal Society of Chemistry PCCP Blog. Calendar of meetings maintained at the CIEMAT (Spain) Fusion Wiki. List of conferences on plasma physics research maintained at EPFL, Switzerland. WIS Plasma Laboratory Conferences on Atomic and Plasma Physics. Paul Scherrer Institute (PSI) Conference Calendar. Plasma and Fusion Calendar of Japan Society of Plasma Science and Nuclear Fusion Research. European Fusion Education Network (FuseNet) Upcoming Fusion Related Events. Calendar of Fusion Meetings maintained at the FIRE Fusion Power site. Conference list at The Astrochymist. Computational Chemistry List (CCL) announcements. Conference announcements on the CERN Document Server.